My original intent was to find a 1957 short bed to go with the ’57 Bel Air and Corvette. After a year or so of looking at ’55 to ’57 pickups (they are essentially the same) I found this one in 2010 near Elkhart, IN. Many times when talking to a car owner about a potential purchase you are given a story that falls far short when you actually see the vehicle. At risk of that happening, I took off early one morning on a five hour drive to Elkhart. When I pulled in the driveway, the owner had the truck parked in front of his garage. At a distance the truck looked even better than described. 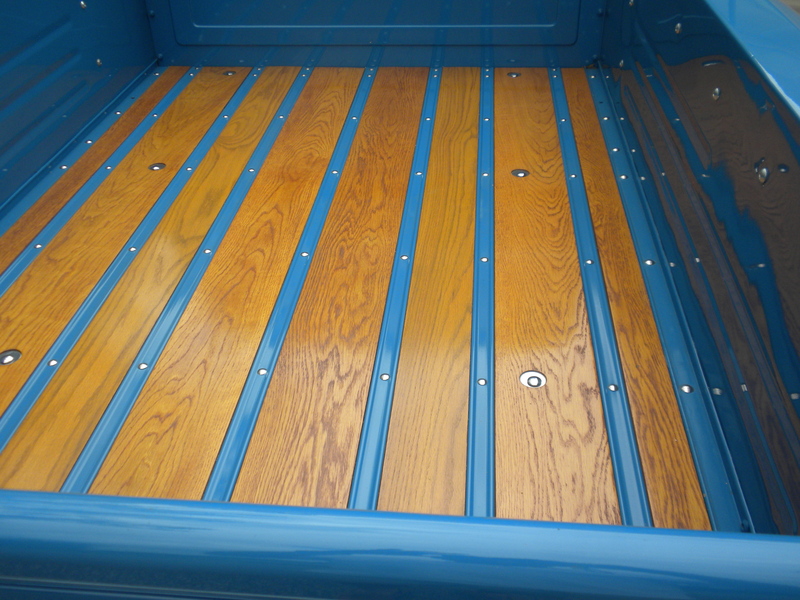 Closer inspection showed the paint to be nearly flawless, the interior in great shape and the oak bed finished to a high level. The owner also produced documentation in the form of prior registration information that showed the 20,600 miles on the odometer to be correct. The owner was a very nice retired fellow who had owned a body shop and had done the restoration work himself. He had done a great job. After a careful inspection and test drive we agreed on a price and I had the car shipped home. The truck is equipped with the 235 cubic inch Thriftmaster six and a three speed transmission. Engine and drivetrain casting dates correspond to the truck build date of October 1955. The truck was originally sold in March of 1956 in Elkhart, IN to a pharmaceutical delivery company. The vehicle was sold to it’s second owner (the individual that I purchased it from) in 1989. I am the third owner. The 1955 model year for Chevy and GMC trucks was split into two. Since the new models were not yet ready at the beginning of the model year, the 1954 models were carried over as ’55s until March 1, 1955 when the new redesigned models were introduced. 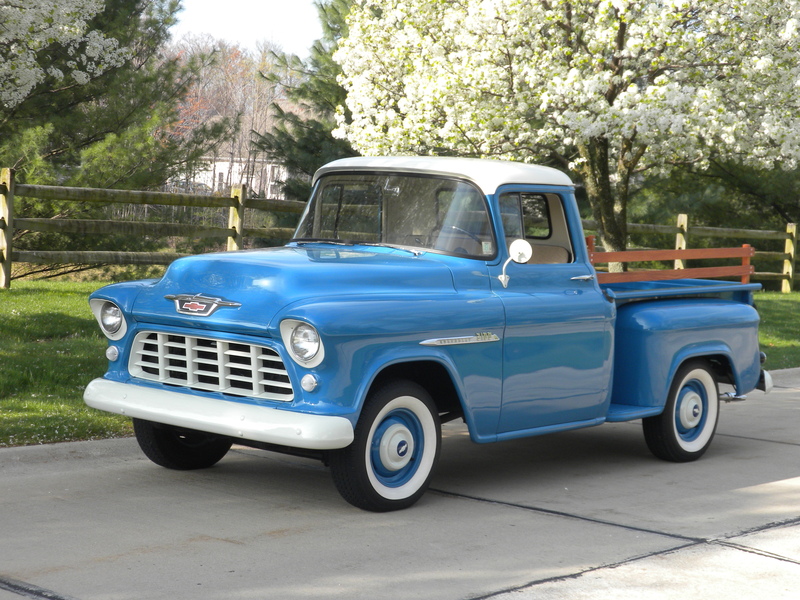 Hence 1955 Chevy trucks were divided into a first and second series. This truck is a redesigned second series. The 3100 series is the designation for a half ton short bed. The second series trucks were the first redesign of Chevy trucks since 1947. The redesign included running boards inside the cab, available power steering, wrap around windshield, the first V8 (a small block 265), egg crate grill (like the 1955 sedans), and a smooth sided option called Cameo. 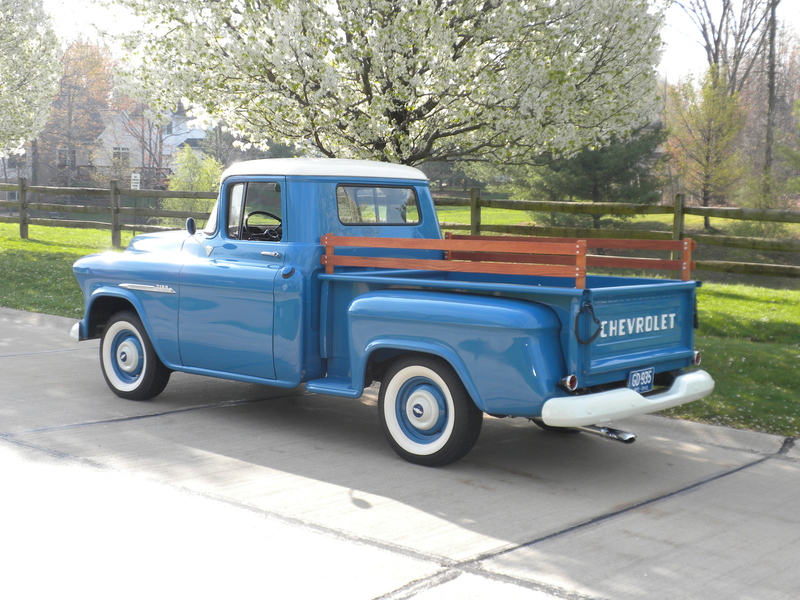 Chevy sold 393,000 trucks in 1955. 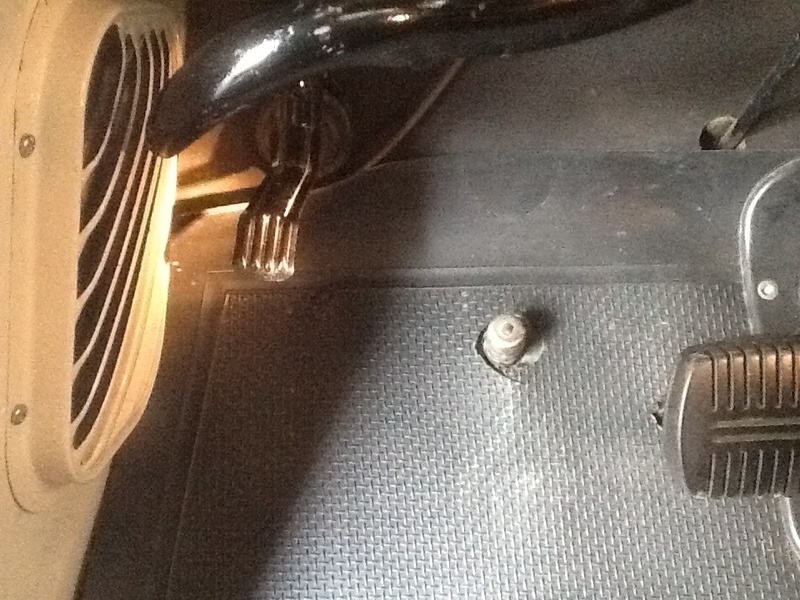 Shortly after receiving the truck, I discovered a pedal near the kick panel on the left side of the driver’s foot well. It looked like an emergency brake pedal even though it was clear that the emergency brake was a pull handle under the dash. A local vintage Chevy truck parts dealer told me it was a pedal for the windshield washers. Unfortunately the water tank, valve and hoses were missing. After a couple of months of searching I was able to buy what was needed off ebay. Everything arrived in good shape, and, with the help of a good friend, we were able to get the original $6.25 optional foot operated system working exactly as intended. The truck represents the most recent addition to my small collection. With each purchase it was necessary to be more and more creative with my wife to convince her to go along with my latest whim. The truck sales pitch included using it as originally intended, to haul things. So the truck has made a couple of trips to Home Depot. When put to use, however, the bed had been protected with layers of towels and blankets. Also, a condition is that my wife come with me to baby sit the truck in the parking lot. She reluctantly admits that not only is the truck “cute” but that she has enjoyed the conversations that have ensued while she patiently waits for me to return from the store. The truck draws attention wherever it goes. The 3100 has proven to be a great running vehicle that drives and shifts smoothly. It does, however, ride like a vintage truck. The truck was very nice in its own, honest simplicity. However, I decided to give it some ‘50s flare by adding chrome options that were factory available for the truck when it was new. 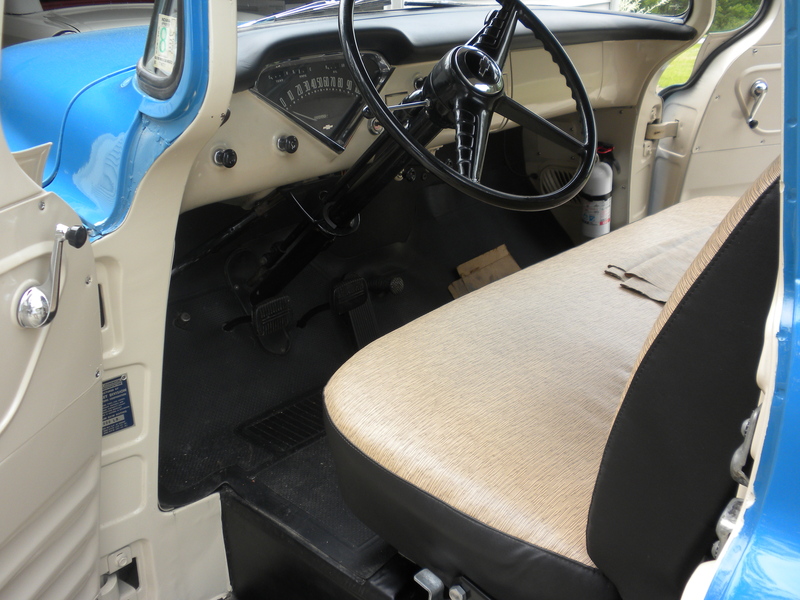 The additions included chromed bumpers, hubcaps, trim rings, mirror, and bed strips. The added chrome made an already very nice truck something worthy of a second look. Recently I purchased a restored 1947 Schwinn/Whizzer motor bike. The story of the Whizzer appears elsewhere in the blog. After enjoying touring the neighborhood on the bike, I decided to mount it in the back of the truck when I take the Chevy to shows. It has been a real source of curiosity wherever it (they) have gone. nice truck! I have inherited my Grandpa’s 55 chevy truck and it looks just like yours, almost! We are getting it repainted now, do you know what colors were used in painting your truck? Also, I’m wondering if the heater and controls are still installed? Phil, I have a truck just like yours! It is really original, and I plan on never selling it! Can you post a photo of that foot pedal for the washer? No problem. I posted it on the truck page. Hope it helps. I recently purchased an all original 1955 Chevy truck just like yours mine has 25,833 actual miles on it and it needs restoring. It was kept in a shed and is not eat up with much rust. It is from the factory with the same colors as yours. It is a 3100 with 6 lug wheels. Seeing yours helps me to see my finish product. I have a long way to go but plan on keeping it all original. I was blessed to get this truck for $2000.00 but I know it will take plenty more to finish it. Do you have any advice for me going forward. Rodney, congratulations on your Chevy truck! With only 25,000 miles, it is worth doing right. Mine was pretty much done when I bought it, but working on the other cars has taught me a few basic things. If your vehicle is original, try to keep it that way as much as possible. Cut and weld in new patches where areas are rusted. If needed, rebuild original drivetrain components, or at least save original engine block, head, carburetor, manifolds, transmission casing, rear end casing, etc. Assuming your truck is numbers matching, keep it that way. It will be more collectible down the road. You must be patient. It took me a long time to learn that. Most of my education came while scraping undercoating off the bottom of my cars. The effort is worth it. No matter how careful you are, you will need some new parts. I have found a number of them on eBay, but you must be careful. If the price looks too good, it’s probably junk. LMC is a good source for Chevy truck parts. Good luck on your restoration. Let us know how it’s going. I have had the truck several months now and I all most have it completely torn down. I am starting back from the frame up. I found that LMC has the best quality parts for it. I’m not in a hurry I figure it will be this time next year before I have it completed. I have a family member that is an auto body repairman and a friend who is a retired mechanic that are helping me a lot. Although I am wanting it done it is more important that it’s done right. Rodney, Thanks for the update. Sounds like you are doing things the right way. Good luck. Hi. 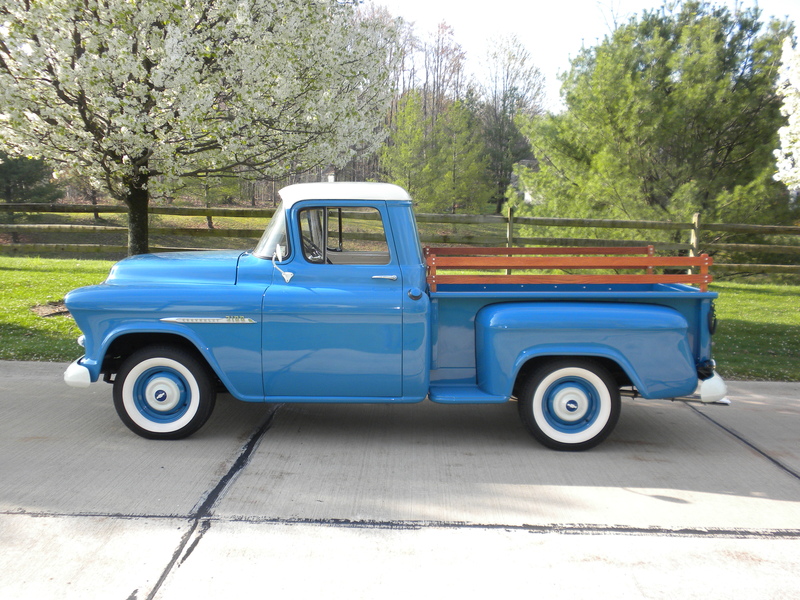 I enjoyed your info on the 1955 Chevy Truck and all the posted questions and answers. 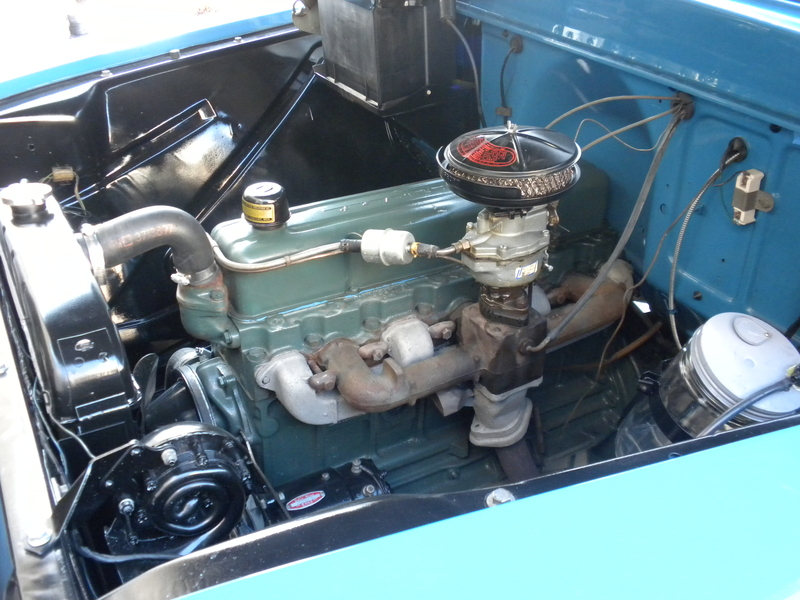 I have recently come upon a 55 truck with the same engine. Can you tell me where the numbers are located to see if the engine is original with matching numbers? Dominic, Congratulations on your Chevy truck. A good source of a wealth of information on the truck can be found by Googling: GM Heritage Center 1955 Chevy truck decoding. There is a downloadable PDF file with what is essentially the Assembly Manual. The first part of it deals with the location and casting numbers of drive train elements on the truck. Good luck. I absolutely love your truck. I’m not driving yet, but when I do, I want to buy a 53 or 55 chevy truck. But the problem is, I’m not sure if I’ll be able to find one is decent condition in time. Any advice? Alyssa, I’m glad you like the truck and are looking for one of your own. The truck is also my wife’s favorite of all the vehicles on the collection. If you are looking for a 53 to 55, I’m assuming you would want a first series 55. The new 55’s weren’t ready yet so the first series was a carry over from 54. It is very similar in design to the 53. My truck is a second series 55, and is heavily redesigned from the first series. It sounds as though you may be a young person. If so, welcome to the hobby. It’s great to see young people getting involved. When the time comes, start looking on Hemmings, eBay, Craig’s List and Autabuy. The Hagerty website has a pretty good price guide to help you get an idea as to what to pay based on condition. Originality is important to me, and usually helps the vehicle retain it’s value as an investment. It’s not the only way to go though, and there’s a vehicle for every taste. If you want to do some restoration yourself, take a look at LMC Truck to get an idea of parts costs. Make sure you look at the truck yourself or have it inspected by a reputable company if it’s out of town. As you get more experienced, you can tell a lot about an out of town purchase by careful research of your own. Don’t be afraid to look at trucks that are close to what your looking for. You’ll learn something with each visit. Take someone with you to offer a second opinion and provide some level of safety. While most old car people are honorable, one never knows these days. A great source of information is the internet. Google 1953 Chevrolet truck and go at it. You’ll become an expert and have a lot of fun at the same time without leaving your home. I hope this has helped, Alyssa. Let me know how you’re doing.